Fire is dangerous. We all know that. But, did you know that the flames themselves might not be the greatest risk as far as health dangers and property damage? Fire smoke is the leading cause of fire deaths, exceeding burns by a three-to-one ratio. And while direct exposure to smoke is harmful to your respiratory system, it can also negatively affect your property’s structure, sometimes in unexpected ways. Smoke from any type of fire is comprised of carbon monoxide, carbon dioxide and soot. Depending on what’s burning, many other harmful chemicals also enter the air, and are inhaled into your lungs or latch onto walls, furniture, clothing, ductwork, and other areas. When it comes to your property, knowing how temperature, the surrounding environment, particle ionization, and airflow patterns affect smoke distribution can help you better restore your property to normal. 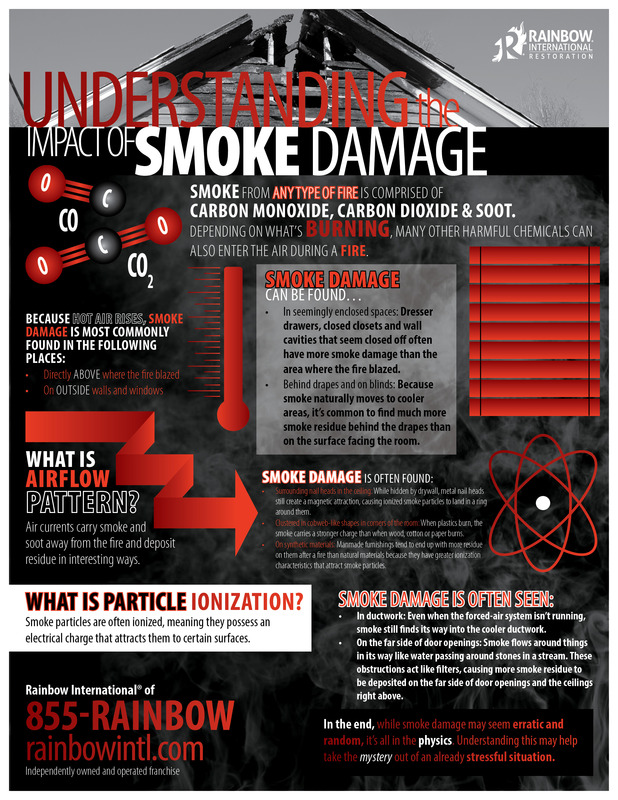 To better understand how smoke behaves during a fire, review this information from the experts at Rainbow International. Directly above where the fire blazed: Assuming no strong air currents are flowing through the building, the highest concentration of smoke residue is usually found on the ceiling above the fire. Outside walls and windows: Cold air sinks below warmer air, opening up a path for the smoke to travel to exterior windows and walls. Even if the fire is concentrated in the center of the room, it’s common to find lots of smoke residue on outside walls. In seemingly enclosed spaces: Dresser drawers, closed closets and wall cavities that seem closed off often have more smoke damage than the area where the fire blazed. The reason is because molecules are more excited in warmer air. The rapid movement creates higher energy sufficient enough to carry smoke particles in the air. In cooler air where molecules move more slowly, there’s not enough energy to keep particles aloft, so they fall out of the airstream and onto surfaces in these cooler, relatively enclosed areas. Behind drapes and on blinds: There’s often a big temperature difference between the room and the space behind the drapes. Because smoke naturally moves to cooler areas, it’s common to find much more smoke residue behind the drapes than on the surface facing the room. Likewise, venetian blinds and pull shades often attract smoke residue more than surrounding surfaces, making the smoke damage here a good indicator of the true overall damage. Surrounding nail heads in the ceiling: While hidden by drywall, metal nail heads still create a magnetic attraction, causing ionized smoke particles to land in a ring around them. The outline disappears after the smoke damage has been cleared away. Clustered in cobweb-like shapes in corners of the room: When plastics burn, the smoke carries a stronger charge than when wood, cotton or paper burns. Sometimes, this causes smoke residue to form “smoke webs” where the walls and ceiling come together. On synthetic materials: Manmade furnishings tend to end up with more residue on them after a fire than natural materials because they have greater ionization characteristics that attract smoke particles. Vinyl in particular can attract such high concentrations of smoke that it becomes permanently stained. In ductwork: Even when the forced-air system isn’t running, smoke still finds its way into the cooler ductwork. The passageway leads the smoke to rooms far away from the fire, resulting in damage to areas that would otherwise have seen little or no impact from the blaze. On the far side of door openings: Smoke flows around things in its way like water passing around stones in a stream. These obstructions act like filters, causing more smoke residue to be deposited on the far side of door openings and the ceilings right above. This pattern diminishes the further away the smoke travels from the fire. In the end, while smoke damage may seem erratic and random, it’s all in the physics. Understanding this may help take the mystery out of an already stressful situation. If you experience smoke damage, call Rainbow International® and restore your property.